Thought fish pedicures were as strange as any beauty treatment could possibly get? Then may we suggest a “celeb escargot” facial that uses snails to rejuvenate the complexion? Ci:zMedical Group in Tokyo is offering a mollusk makeover with their service that takes advantage of the anti-aging properties of snail slime. Described as “sticky” and “ticklish”, the treatment is touted to help with everything from sunburn to rashes. Beauty experts discovered the wonder of snail secretions decades ago when they observed that the scars on the hands of escargot farmers healed unusually well. Ci:zMedical Group promotes its sixty minute session for about $240 with an additional live snail option for an extra $100. “Essence of escargot” has already been added to many high-end skin creams around the globe, but this is the first known instance of using live animals. Considering some other lengths that individuals will go for beauty, such as injections of Botox, facelifts, or laser exfoliation, snails seem to incur little damage. However, the “ick factor” and price tag might get in the way of most seeking to fight the ravages of time with the same creature infesting their gardens. This would a new and slightly unnerving experience (like slugs are and ants tickle); however, I would love to try this, as long as the snails are organic and not carrying diseases. It sounds like something young kids would do, ha, ha. Thought fish pedicures were as strange as any beauty treatment could possibly get? Then may we suggest a "celeb escargot" facial that uses snails to rejuvenate the complexion? 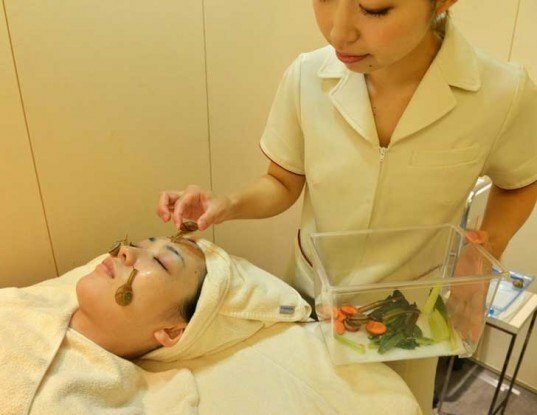 Ci:zMedical Group in Tokyo is offering a mollusk makeover with their service that takes advantage of the anti-aging properties of snail slime. Described as "sticky" and "ticklish", the treatment is touted to help with everything from sunburn to rashes.